Agriculture, lumber, and government service form the economic base for Modoc County, with a small contribution from tourism. 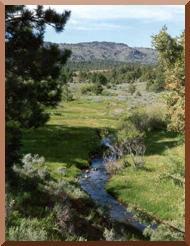 In addition to the Forest Service and Bureau of Land Management, there are the Modoc National Wildlife Refuge, the California Department of Forestry, county and city governments, Caltrans, Modoc Indian Health Services, two modern hospitals, four libraries, three banks, two weekly newspapers, AM and FM radio stations, five school systems with a community college outreach located in Alturas, and local manpower training through JTPA. Modoc Joint Unified School District has been determined to be one of the top one hundred schools in the nation, according to Offspring Magazine, “The Magazine of Smart Parenting.” The ranking was determined by an Ohio based firm, School Match. Using living cost data, standardized test scores, income and property values, the firm found MJUSD to rank among the top 100 in the nation and the top seven in California, along with Palo Alto, Beverly Hills, Carmel, and Laguna Beach. Youth opportunities are outstanding, with an excellent school system that provides high quality education, organized activities, and a top athletic program both summer and winter. Modoc Joint Unified School district has been recognized as California Distinguished Schools: Modoc High School, Alturas Elementary School and Modoc Middle School. Alturas Elementary School has the exceptional distinction of being selected as a California Distinguished School twice. Community supported activities include little league, youth soccer, church. Modoc High School on Main Street Alturas sponsored summer camp at Blue Lake, a junior livestock show and sale involving both 4H and FFA, a very active Boy Scout troop, a community run Nordic and alpine skiing facility on Cedar Pass, and youth activities at the county fair. Swimming at the Alturas public pool, water skiing, backpacking in the Warner Mountain wilderness area, hunting, fishing, and horseback riding provide additional recreational and instructional opportunities. There are also two excellent nine hole golf courses, with no waiting. Modoc County remains close to its history. Many residents’ grandparents arrived with the first settlers in the 1870s. Wagon tracks on the Applegate Trail to Oregon are still visible when Goose Lake is dry, and the western lifestyle is reminiscent of the turn of the century era. Cattle drives still fill county highways in spring and summer, one in Alturas, one just outside of Likely. The Modoc County Historical Museum sits at the south end of Main Street. Modoc County Museum located at South Main in Alturas. A multitude of artifacts and documents representing the history of Modoc County are available for view. Modoc County remains close to its history. Many residents’ grandparents arrived with the first settlers in the 1870s. Wagon tracks on the Applegate Trail to Oregon are still visible when Goose Lake is dry, and the western lifestyle is reminiscent of the turn of the century era. Cattle drives still fill county highways in spring and summer. Artifacts in the county museum and narrations in the Modoc County Historical Journal recall the “early days.” An annual production, produced by a local theater arts group portrays the events of the last major Indian war, in which 70 men, women, and children of the Modoc tribe bravely fought off 1,000 U. S. troops for over six months in 1872-73. If you want a home in a land with charm and beauty away from the crush of traffic, the taste of smog, and a hectic pace swallowing up your life, visit Modoc County where the roots go deep.